You can specify the type of voltage divider to measure input voltages over 5 V: no voltage divider, divider with one resistor (internal resistor of K8055 acts as the second resistor), divider with two resistors. 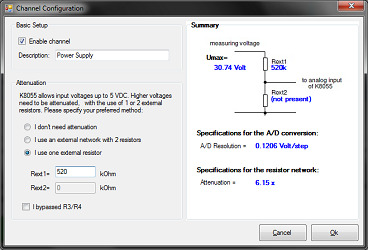 Shows the min/max voltage for each channel. These values can be reset at any time. Averages 1 to 10 samples for a better accuracy. Takes a single sample every 20 - 60000 milliseconds. Has the option to log the data to a .CSV file. This file type can be opened with Excel. Has the option to insert markers/comments in the .CSV file. You can mark events with it. REMARK: any inserted comments. It serves as markers to indicate an event. 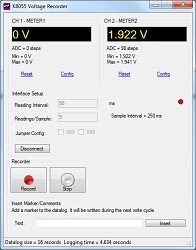 Here you can download the latest version of the Voltage Recorder. It comes as a zipped file that includes source code, setup wizard and the K8055D.DLL file. The software is written in Visual Basic .NET framework 3.5 so you need to have the .NET on your computer. Note: in this version of the software the logging interval isn't very accurate. This shouldn't matter for most applications: Each line in the logfile has a timestamp so you can always view the timings. In the future I will build a more accurate logger.